I don't know about you guys but one of the things I love about Christmas (yes I said it) is the time spent with family and something we really enjoy doing together is playing a good board game, even though there is always someone complaining that there's a cheater amongst us and of course there is always the obligatory sore loser. In aid of my love of board games over the next three weeks I will be showing you three board games from the wonderful people at John Adams and IDEAL (before you read on go and check out their Facebook page for more gaming fun). First up is a new favourite of mine, Telestations. "It's the game where you DRAW what you see, then GUESS what you saw!" What instantly drew me to this game was what I like to call the 'laugh factor', it was a game that couldn't be taken too seriously by anyone and also one that could be enjoyed by all, no matter their age. I mean the objective written on the instructions is to laugh a lot and have fun with friends and family, now that I can do! Inside the box you get: 100 This Side & That Side cards, 8 erasable books, 8 clean up cloths, 8 dry wipe markers, a 60 second timer and the instructions themselves. Now something else that made this game fun for me was its simplicity. 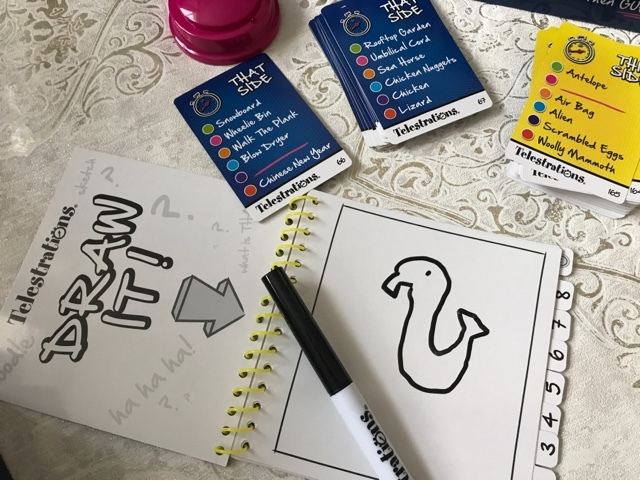 The set up was quick, place the cards, timer and cloths in the centre of your group of players, decide which side of the cards you're using, make sure you've all got a sketch book, a marker and a card, then let the games begin. 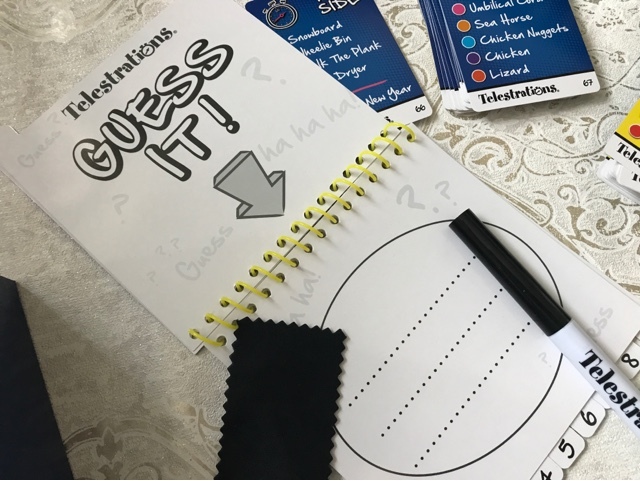 The pages in the sketch book are labelled with either DRAW IT! or GUESS IT! All you need to do is agree how to pick a word and remember which way round the group the sketch books are being passed. You honestly can't go wrong, well you can when you struggle to figure out what the person next to you has drawn but really that's what makes this game so hilarious. 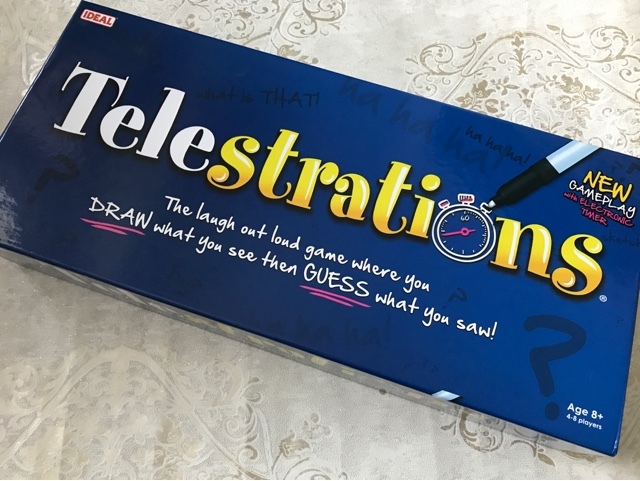 Keeping things family friendly there are even suggestions on how to score the game, friendly scoring or competitive scoring, although that's if you even want to, you might just get Telestrations out to have a bit of light hearted fun. And of course with the wipe clean books the fun can easily be started all over again. 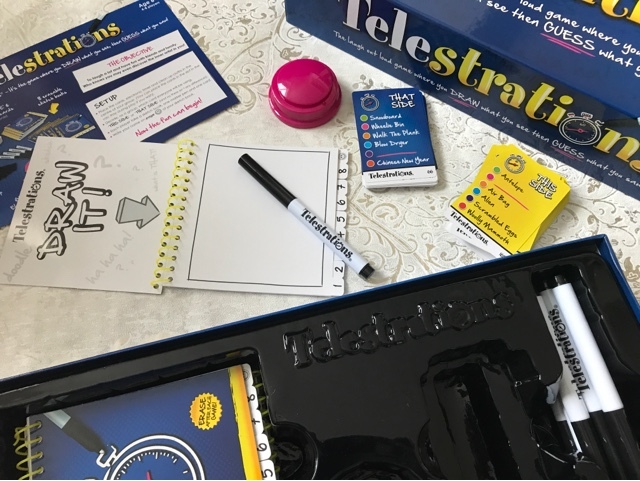 Telestrations is recommended for those aged 8+ although my 5 year old did give it a good go with a little help from mummy. You can play with as little as 4 people and as many as 8, you could even have a go at playing it in teams, all I know is that this definitely puts the FUN back into board games, artist or not, you'll suddenly feel the need to draw!